Revels -- producer of the annual "RiverSing" and "The Christmas Revels" -- will shake off the winter doldrums with a "Revels Spring Sing." 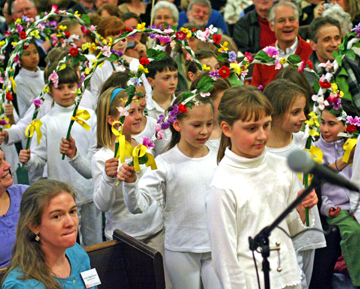 The communal singing of seasonal songs will take place at 3 p.m. on Saturday, March 20 at St. John's Church, located at 80 Mt. Auburn Street in Watertown. Led by Revels music director George Emlen, the event will also feature "Christmas Revels" song leader and master musician, David Coffin, as well as selected soloists from past Revels performances. The family-friendly afternoon will also feature music by a string band and a Spring mummers’ play. Children in attendance will enjoy special activities just for them, including a mummers’ play performed by children from Revels Spring Workshop. For tickets and information, call Jennifer at 617-972-8300 ext. 31. or visit www.revels.org.